Almaty Backpackers i Almaty, Kasakhstan: Reservér nu! We have cancellation policy. We charge 30% of the booking fee for no-show and reduction in numbers of nights to the guest&#39;s credit card. 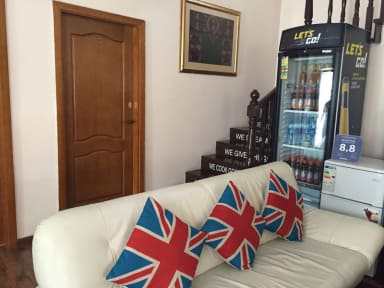 Almaty Backpackers is set in what one Hostelworld reviewer calls a 'new, clean and secure ' with a convenient location. Many of our guests say they 'would stay again and again' in this hostel when in Almaty. The 'knowledgeable', 'friendly and helpful’ staff are praised for helping 'when it came to planning travel not only in Kazakhstan, but also in Kyrgyzstan! ‘. I believe that this is the best hostel for backpackers to Almaty. Whether you're a backpacker or a budget traveler, you will enjoy our hostel. Clean and comfy rooms combined with our great service and location will be one of the most unique experiences you will have in one of the biggest city in Central Asia - Almaty. It is easy to forget when you stay at Almaty Backpackers that there is a one of the active city of Central Asia just outside waiting for you! We are close to two main roads in Almaty - Dostyk and Al-Farabi so you can be in any of Almaty's sights and nightlife within minutes! Or you may walk to the Kok-tobe park, Republican Square and former President White House, which are 10-15 min. away from the hostel.